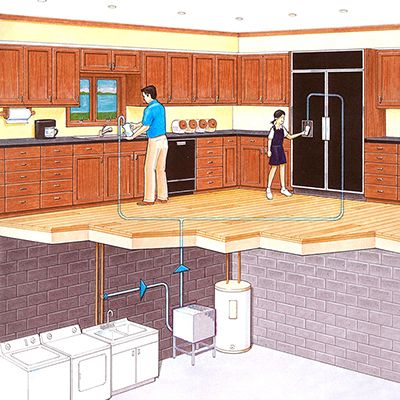 Our distillation systems for the home provide families with the highest quality drinking water available. And since Pure Water Distillation Systems provide 99.9% pure water year after year, they offer absolute peace of mind! Pure Water Brand has a wide range of Distillation Systems for every size of family. Our systems for the home range in production from 11.4 liters per day to 45.5 liters per day, or even larger if needed. This means that instead of rationing your bottled water for only drinking, you can now use pure, great tasting distilled water for all of your consumable needs! The stainless steel construction and great warranty make this an excellent investment for any homeowner. If you use the distilled water for all of your consumable water needs, you should save at least two or three times the investment that you put into the distiller. Not only will Pure Water Brandproducts save you money over bottled water, it will save you a great deal of hassle! Just think, no more delivery hassles, no more lifting heavy bottles or throwing away bottles from the store. You won’t have ugly bottles taking up all of your space and you won’t have to run out of water again! Pure Water Brand manufactures a full range of distillers. Our distillation systems for the office can save businesses time, space, money and hassle. The excellent quality and long life of our distillers means that you will be able to generate a significant income from these machines for many years to come. 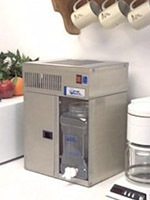 Pure Water Distillation Systems for the office provide the highest quality drinking water available directly to one or more water coolers that can be conveniently located around the office. The different systems available can produce from 45 to 227 liters of drinking water every day. This capacity should provide plenty of drinking water for most businesses. Larger systems are also available. No more lifting bottles! Five gallon bottles weigh 19 kilograms. They are a hassle and they’re dangerous to lift! How much money does it cost a company to pay for Workman’s Comp? No more bottles laying around the place just taking up space. Pure Water Distillation Systems for the office can save businesses quite a bit over what they would spend on bottled water every month. Businesses should never run out of water with a Pure Water Distillation System. Save time, space, money and hassle . 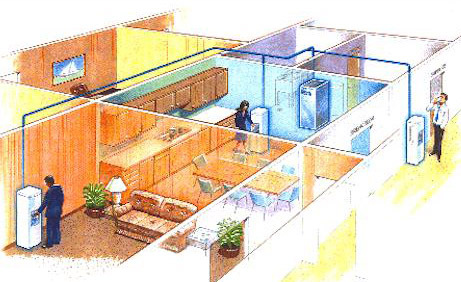 Our units are easy to install in nearly any office setting.